On March 31st, 1621, King Philip III of Spain, also known as Philip the Pious, passed away. He had rarely acted as a true ruler, having entrusted all authority to his favourite, the Duke of Lerma. When the young prince Philip IV succeeded to the throne, a new competitor arrived at court, the power-hungry Count of Olvares. 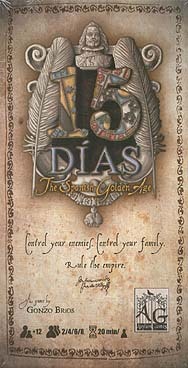 Although the Duke of Lerma had been compelled to leave the court, after falling from favour and accused of massive corruption, his family hoped to hold onto power at any cost... "15 Dias: The Spanish Golden Age" is set in this context of backstabbing, treachery and palace intrigue. Who will become the new "Valido"? Would you betray your own next-of-kin to obtain the grace of the King? All of this, and much more awaits you in "15 Dias: The Spanish Golden Age", a card game full of history and intrigue, no regrets, betrayal and above all, ambition.